Episode 22 is the 2nd interview show! Today Dr. Aaron Horschig is joined by strength & exercise science expert Greg Nuckols. Greg is a powerlifter and avid researcher who puts out a ton of amazing content on Strongerbyscience.com. Today we chat about all things programming, and focus on the sub-topic of training frequency! Enjoy. Episode 12 is the first interview show, and who best than 2 olympians! Chad Vaughn and Cheryl Haworth are two of the most decorated olympic weightlifters in United States history! We dive deep into technique, programming, the mental approach to lifting big weight and how to manage injuries common to weightlifting! In this episode we dive deep into one of the most prevalent causes of knee pain with strength athletes - patellar and quad tendon injuries. Dr. Aaron Horschig not only discusses how someone develops pain at either of these tendons but a few ways you can kick start your own healing process. Episode 2 of the show dives into the basics of WHY we develop knee pain as strength athletes. These injuries don't often come all at once (like when a football player tears his ACL) but instead are due to a culumination of micro-trauma sustained at the knee joint due to poor movement quality. Today we break down how to screen your body to find the underlying cause of WHY you developed knee pain using a method called the 'Joint-by-Joint' Approach. 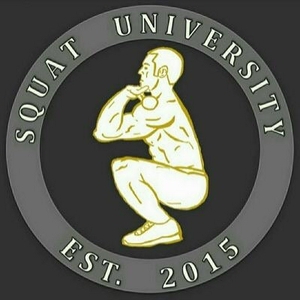 In episode 1 of the podcast, Dr. Aaron Horschig introduces the WHY behind Squat University and the format for the upcoming podcast! We then dive in deep into the 'The Foundation' of a movement first approach to training and how this mindset can not only keep you performing at your best but limit potential injuries in the future!